Mayor Michael B. Coleman and the Columbus Recreation and Parks Department invite the public to celebrate the city’s newest holiday tradition, the Grand Illumination, on Fri., Nov. 30 downtown in Bicentennial Park, 233 Civic Center Dr. Activities begin at 5 p.m. with the lighting ceremony to follow at 6 p.m. Admission to the event is free. 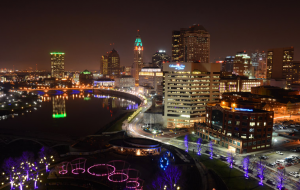 Last year, the annual City Hall tree lighting ceremony was transformed into a spectacular urban light display as Mayor Coleman lit Bicentennial Park, the Scioto Mile Promenade, and City Hall with the flip of a switch. This year the Grand Illumination will feature three times the amount of lights as in 2011 including 200,000 LED lights on 150 trees. New in 2012, the ceremony will showcase a stunning light show choreographed to seasonal music and Bicentennial Park will feature dynamic, holiday imagery projected onto the AEP Fountain, creating a one-of-a-kind visual experience. During the ceremony, visitors can enjoy a special video message from the Mayor, traditional carols performed by the Columbus Children’s Choir, BalletMet Columbus’ Nutcracker and Clara, and an appearance by Santa. In the spirit of giving, attendees can also help support the Mid-Ohio Foodbank by purchasing a piece of handcrafted pottery, created for the Empty Bowls project, and receive a bowl of gourmet mac ‘n’ cheese compliments of Milestone 229. In addition, guests are invited to stroll through the park and enjoy the activities including making edible Christmas trees with the Franklin Park Conservatory, meeting the Columbus Blue Jackets’ mascot Stinger and entering contests to win prizes, viewing the holiday lights with a cool prism effect through glasses from COSI, and receiving discount coupons and free giveaways from Mad River Mountain. Following the ceremony, visitors are invited to have complimentary refreshments, while children visit with Santa and receive a holiday gift. Beginning at 7 p.m., visitors can make their way to COSI to attend Family Friday Night for the discounted price of $5 per person. Tickets to COSI will be available at their tent during the Grand Illumination. 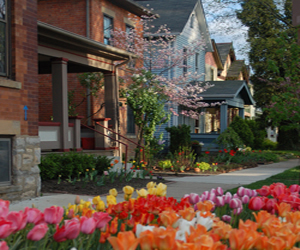 In continuing with the Mayor’s green initiative, all seasonal decorations will feature energy efficient LED lighting. Bicentennial Park, the Scioto Mile Promenade, and City Hall decorations will remain lit through mid-January. The event is free to the public. Complimentary parking available at COSI with printed voucher available at www.SciotoMile.com or ‘Like’ us on Facebook.